How to Reach: Jammu can be reached via flight, train and roads from any nearby city. From there one has to take a bus to Katra, which is the starting point of Vaishno Devi. Located in the mighty Trikuta Mountains at a distance of 60 kilometers from Jammu, is the famous Vaishno Devi Temple. One of the most visited and worshipped pilgrimages in India; the Vaishno Devi shrine is the epitome of devotion and belief in the Almighty. Situated at a height of 5200 feet above sea level, the Vaishno Devi Mata pilgrimage is visited all through the year. It is better to avoid visiting this pilgrimage during severe winters as the path becomes very dangerous due to snowfall and sleet. Read on to know the legend behind the famous Vaishno Devi temple. It is believed that more than 700 years back, a selfish demon known as Bhairon Nath came to know about a young girl named Vaishno Devi, who was the ardent devotee of Lord Shiva and supposedly the incarnation of Goddess Devi. In order to attain salvation easily, the selfish demon chased her while she was going towards the Trikuta Mountains. She quenched her thirst at a stream, which is now known as Banganga, located right at the start of the Trikuta Mountains. 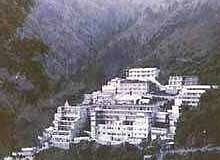 It is said that Vaishno Devi meditated in a cave to acquire divine powers to slay the demon. It took Bhairon Nath nine months to locate her and hence the cave is known as "Garbha Joon". She emerged out of the cave after intense meditation and fought the demon. She assumed the form of Goddess Kali and separated the head of the demon with one powerful blow. The head landed at a distance of 2 kilometers above the holy temple. During his last moments, Bhairon Nath pleaded to be given salvation. 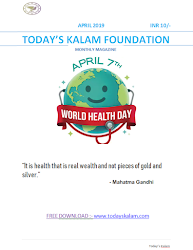 Since Vaishno Devi knew that he was chasing her for attaining salvation, she granted him not only salvation but also granted him a boon that devotees will not go back without visiting his temple. That is why till date, anyone visiting Vaishno Devi travels further upwards and visits the Bhairon Temple to finish the holy journey. Devotees have to climb up the mountain for a distance of 13 kilometers to reach the Vaishno Devi Temple. The path is cobbled and narrow and has the steep valley on one side. Devotees tread along this uneven path with full devotion and get the strength from the sheer belief in God. The air over here is always alive with the cries of "Jai Mata Di" in the praise of the Goddess. The Garbha Joon is located halfway and devotees have to pass through the cave that Vaishno Devi meditated in. On reaching the temple, one has to pass through another cave to get the "darshan" of the Goddess who assumed the form of three small rocks known "Pindi". The three rocks resemble her three heads.